A vast, white and silent pan spreads out like a lake in front of you, yet it’s dry. Telltale tracks in the salt crust reveal only who visited this place the previous night. Birds call in the bush behind you, and in the distance you can just make out a gemsbok hanging in the mirage. The sun begins to set swiftly, as it does in Africa, through a thin strip of distant stray cloud. 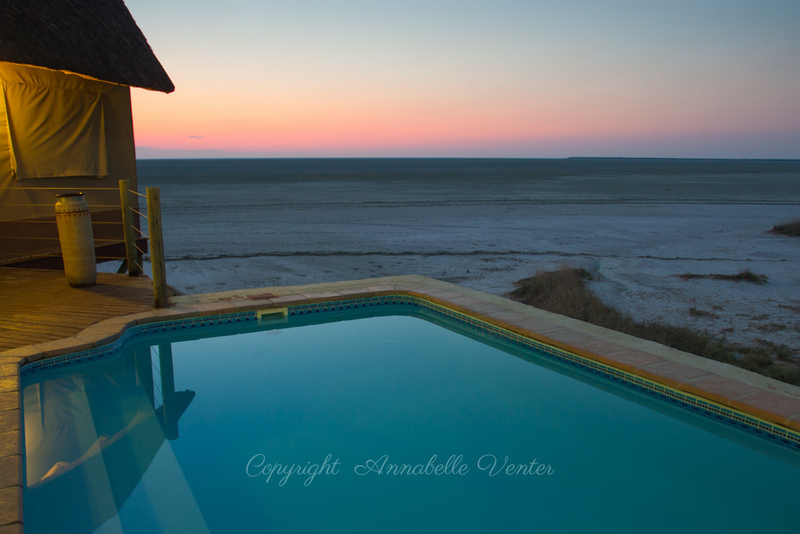 The best part of this scene is that you don’t have to turn your car around and head back for camp to make it home before the gates close, because you are in camp, sitting on your own private deck, in fact, watching the end of another glorious day in the Etosha National Park. Onkoshi Camp, situated in the far north-east of the park about 43 km from Namutoni, was opened in September 2008 and serves to give the visitor an opportunity to experience the pan 24 hours a day. When it first opened, the pan was full of water due to excellent rainfall that year, but it has been mostly dry ever since. Nevertheless, this doesn’t detract from the beauty of the camp. In fact, it makes for interesting viewing of the occasional animals passing by, of fascinating mirages, and of animal tracks left by nighttime visitors. When we were there, a rhino had walked past the restaurant during the night, leaving big, heavy prints in the pan surface. 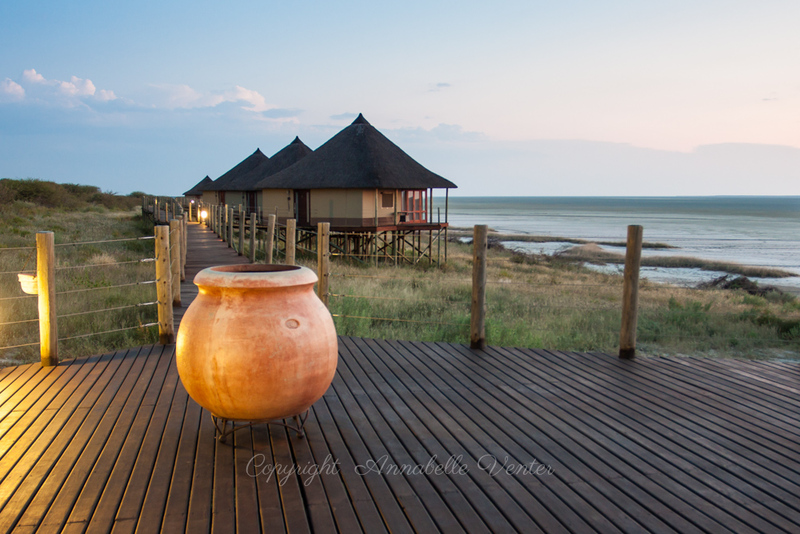 It’s an unfenced camp that hugs the edge of the pan, with 15 tented chalets that are accessed from an elevated walkway. Lions and leopard occasionally visit the area, and we were woken in the pre-dawn hours by three hyenas snuffling in the undergrowth just below our deck. Each tent is powered by solar energy and insulated by a thatched roof. You have the choice of an indoor or outdoor shower, while large folding wood-and-glass doors frame the expansive scene in front of you. Huge mosquito nets envelop the beds, so you can leave the doors wide open in summer to catch the breeze. Room service will bring you a flask of boiling water for your tea, and will be happy to freeze or refrigerate your food or drinks for you, if need be. 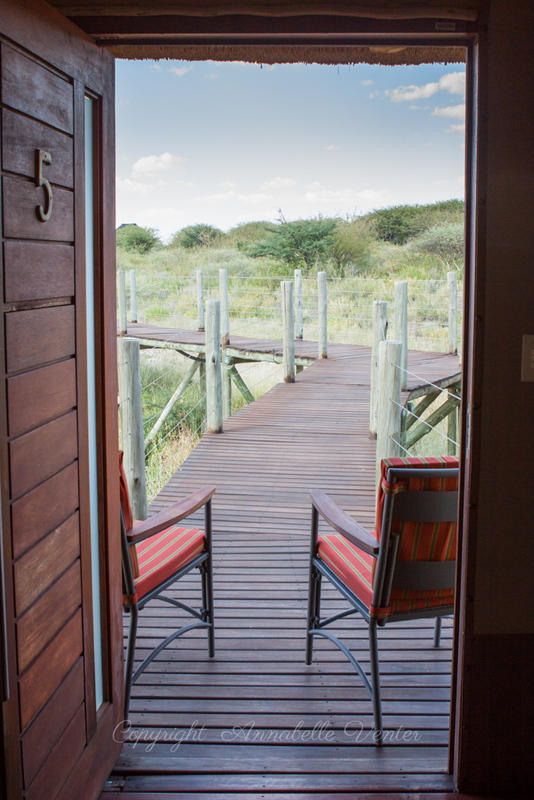 As the late afternoon sun penetrates the pan-side of your tent, take your chairs out to the walkway and watch the bush titivating for the late afternoon viewing. We watched a waxing moon rise from the shade of our front door, while small birds flitted about in the bushes, and a mongoose made a dash for cover. Or you could go for a late-afternoon drive through the woodlands close to camp. 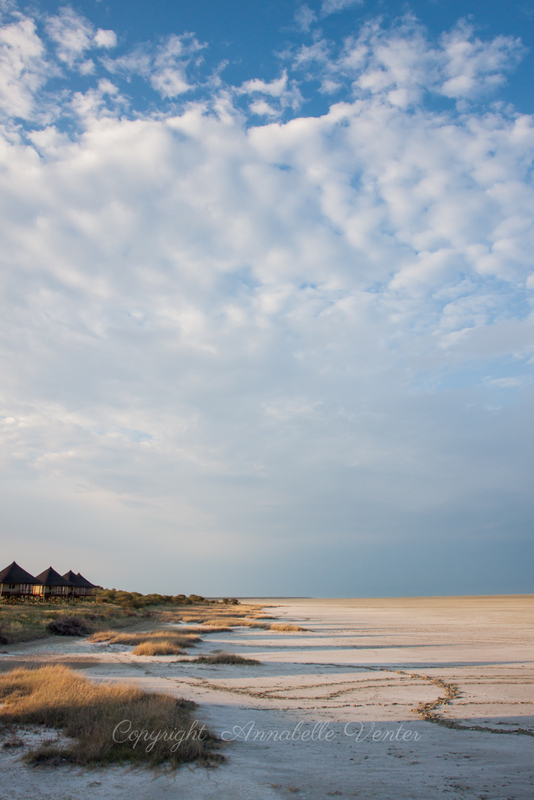 Onkoshi feels different to other Etosha camps because it is separated from the roads that are open to the general public by a 15-kilometre drive through some of the most attractive woods in Etosha. Yes, you’ve read right – thick, secret woodlands with trees you won’t find further west in Etosha, such as Lonchocarpus nelsii (Kalahari apple leaf)and Terminalia sericea (silver terminalia). Also lavender crotons, raisin bushes, purple-pod terminalias, trumpet thorns and many more. This was undoubtedly the highlight for me – slow driving down a deep, sandy, winding track not knowing what you’ll find around the next corner. 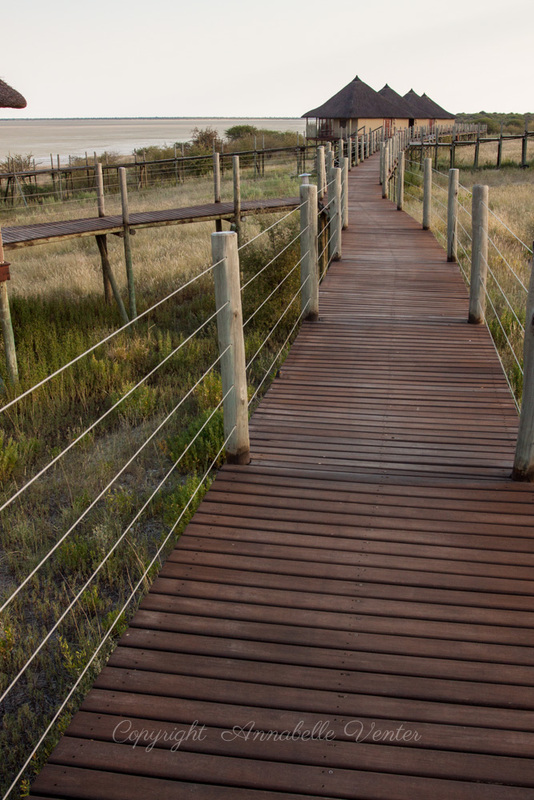 We came upon spoor of all four of the Big Five species that occur in Etosha – elephant, rhino, lion and leopard – as well as a multitude of antelope tracks crisscrossing the sandy forest floor. Fellow visitors were lucky enough to see a leopard right outside camp when returning from one of the afternoon drives. Steenbok, kudu and warthogs scurried away into the undergrowth at our approach. 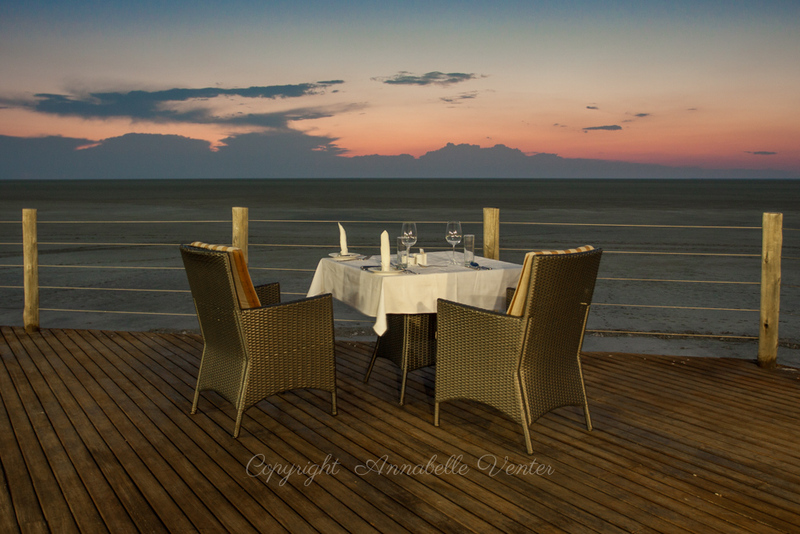 Dinner is served in what is unequivocally the best location in Etosha! In good weather, the tables are set out on the deck, which affords you a vast and silent view over the pan – loads of empty space providing a marvellously meditative experience. Nightjars can be spotted hunting on the pan below the deck. 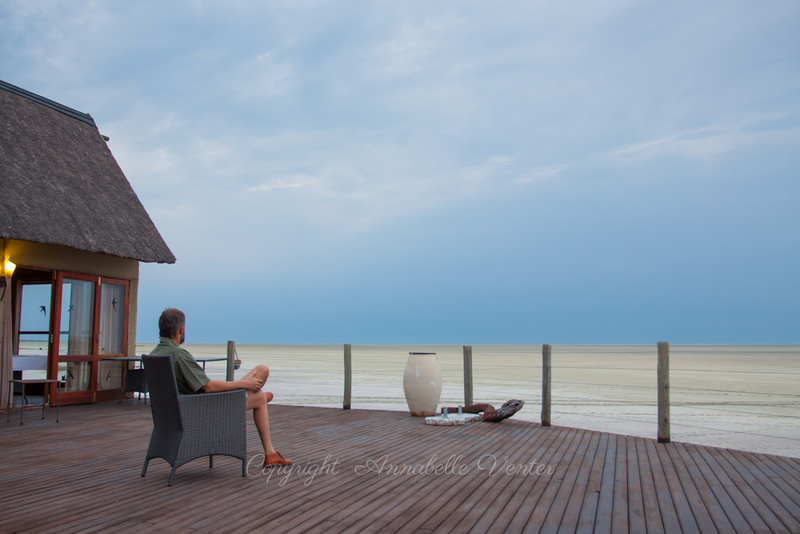 It’s hard to drag yourself away after dinner, but you can continue the viewing from your own deck, and we sat out till well after midnight, witnessing a spectacular electrical thunderstorm far away on the pan horizon. Breakfast is an equally breathtaking experience. In the soft morning light, swallow-tailed bee-eaters and fork-tailed drongos hunt early, swooping over you while you sip that first coffee of the day. 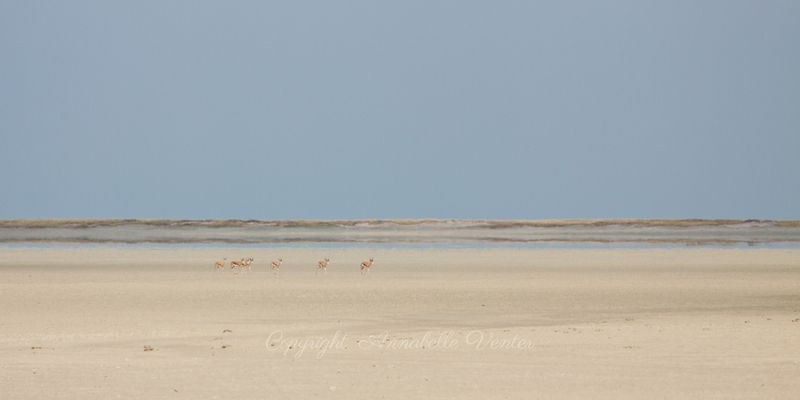 At the time of our visit there was just one single-lane sandy track to and from camp, and visitors from Namutoni were transported in and out by game-drive vehicle. This meant little traffic, but also posed the risk of rounding a bend to find yourself face to face with another camp vehicle – a potentially dangerous situation! Sunday Nelenge of Namibian Wildlife Resorts told me recently that the track has now been widened and gravelled to accommodate sedan cars self-driving to the camp. He says that if you arrange it beforehand with the office staff at Namutoni Camp, you can book lunch as a day visitor to Onkoshi. 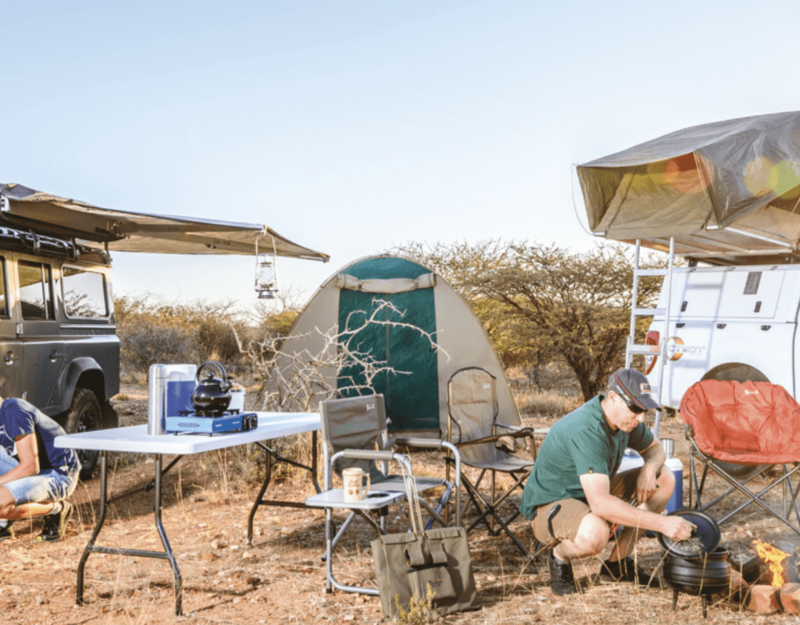 If you can tear yourself away from your deck and want to explore the wider area, there are several options to choose from, such as a few good waterholes near the camp. 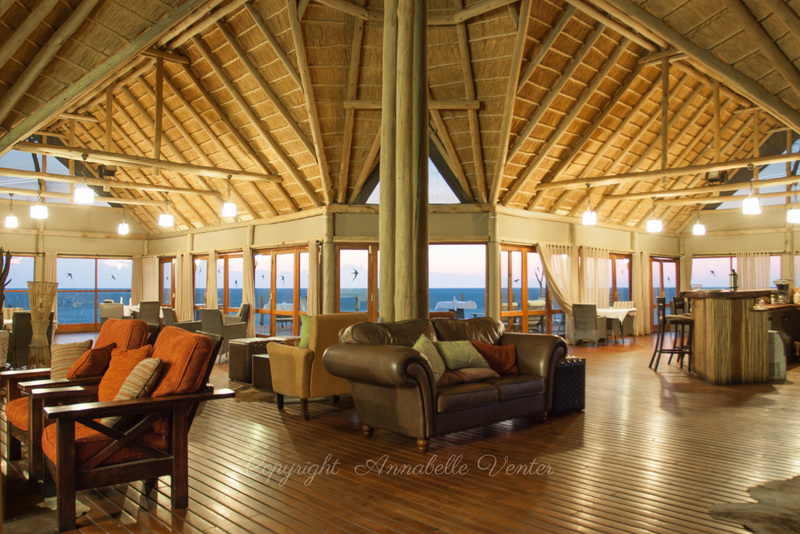 Namutoni is not too far away if you want to visit Chudop at first light – always a good option for lions. There we encountered more hyenas socialising and playing in the water. Nearer home you can watch elephant interactions at Tsumcor, and Stinkwater on the edge of the pan is excellent for elephants and often lions. 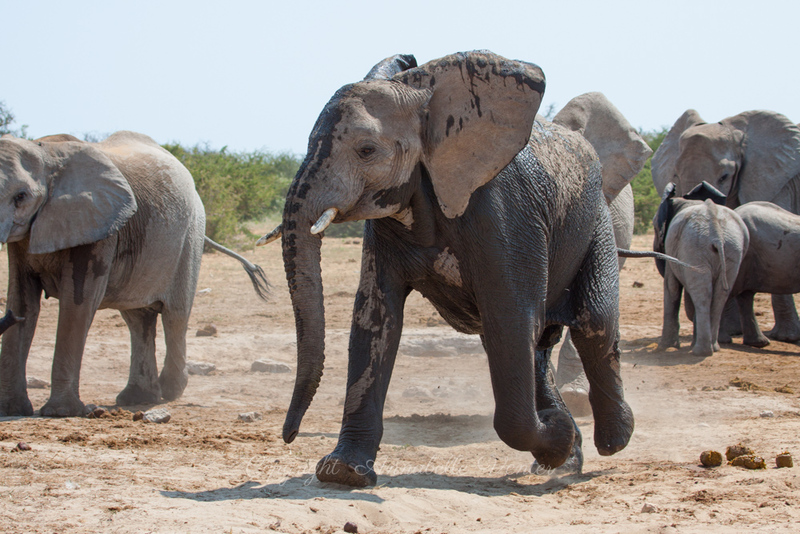 Once we found a herd of elephants with babies here having tremendous fun in the mud. The pan scenery is mesmerising, and you will often find a few antelope tottering along in the mirage. 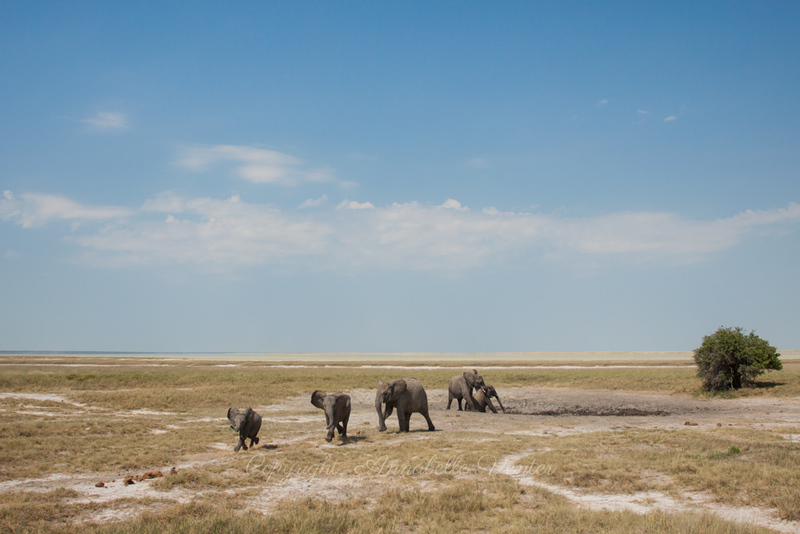 A slightly longer drive north will take you to the Andoni Plains, an area that is good for plains game as well as for the occasional endangered blue cranes. When the time comes to leave, you feel a little sad, because Onkoshi is one of those special quiet places, off the beaten track – one that grows on you, beckoning you to return soon.